Check is back. This season, tartan prints are being seen on everyone by the likes of Jessica Alba and Atlanta de Cadanet Taylor. Printed trousers are all over the streets but the print you should be investing in is a good classic tartan print. On the Spring/Summer 2013 catwalks in London, Paris, New York and Milan, designers such as Chloé, J.W Anderson, Michael Kors and Ralph Lauren all weaved a fragment of tartan into their designs. Geometric checks give traditional plaid a modern outlook as seen by Louis Vuitton’s Spring/Summer 2013 show which showed us check at its simplest, representing classic monochrome chessboards, exhibiting checkerboard squares in lemon yellow, olive green and leathery brown. A clash-of-prints interpretation from designers such as Dries Van Noten and Phillip Lim injected some summer florals onto classic checkerboard backgrounds in order to carry the plaid trend through into the summer months. The high street were not slow to pick up on the plaid trend either. J.W Anderson’s collection for Topshop gave us tartan two-pieces in red and blue check (à la Delilah at the launch party). 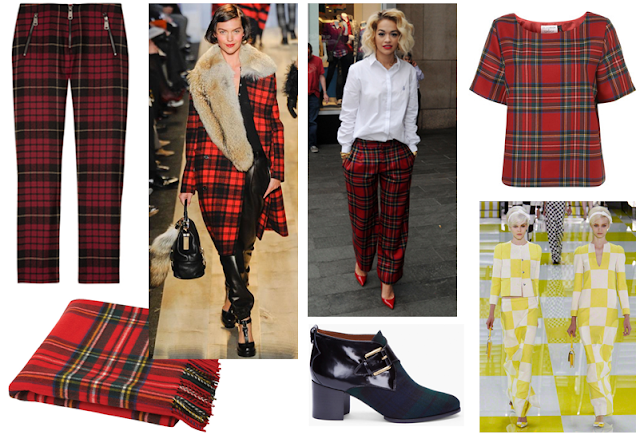 A tartan print can easily be injected into any outfit with a red plaid wool scarf or western shirt. It’s time for tartan. The above is my first 200-word article for my online LCF Fashion Journalism course. I chose a trend I liked and wrote to an audience who are interested in fashion as novelty. I was meant to post this last month but better late than never, right?